Your Business website is an important part of the image you portray to consumers. The look of your website is as important as the look of your store or office. A good design can show the credibility, professionalism, and organization of your Drexel Hill business, but a poor or outdated design can have the opposite effect. See our Portfolio for examples of our work. We design to fit your business, your budget and your competition. Joe the Drexel Hill Plumber who just started his own business needs a website, but he is probably better served by using a pre-designed template because he has very little money to invest and will likely need to make changes frequently. On the other hand, Ryan, who does custom paint work in Drexel Hill, needs a great custom design to showcase his work to potential customers. Jill's two main competitors in Drexel Hill recently redesigned their websites, and now she is losing ground. Web SBZ can help her get back in the competition. We take a comprehensive look at your business, your budget, and your competition before we design your website. An effective website needs constant attention. 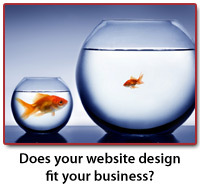 Some web design companies can leave you feeling like a small fish in a big pond. It is difficult to get the right person on the phone when you call, and even the most simple of updates can take weeks and cost hundreds of dollars. Contact us to inquire about managing your website. We can help you move away form your old company without completely re-designing your site. Our development rates are very competitive and most updates are handled in 48 hours. In some cases, we can train you on a program to update your own content. In any case, our office located less than ten minutes from Drexel Hill in nearby Havertown allows us to quickly address any questions or concerns that may arise.